This application note reviews the elements of transmission line measurement in the ham radio environment. It demonstrates how you can measure line impedance, return loss, SWR, velocity factor, distance to fault and line losses using pulse interrogation techniques. It focuses on the new preciseRF TDR-CableScout® pulse generator as a companion acces- sory to an oscilloscope. 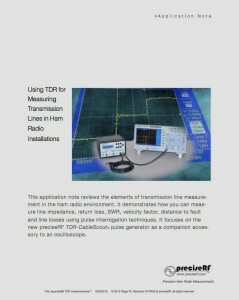 This application note serves as a tutorial and review of TDR measurements and as a user guide for the TDR-CableScout®. Included are step-by-step instructons on how to use it with your oscilloscope. Topics include transmission line faults and how to locate them, reflection coefficient, return loss, SWR, cable impedance (Zo) measurements, distanced to fault (DTF), velocity factor (VF) and line loss measurements. ← New! Precision TDR Pulse Generator for Ham Radio features TDR computer with 150ps pulse Tr.